← Are You Using Instagram To Show Off? The good news is, the competing salons don’t have many reviews either, but I think you could do much better. Let me share everything I know about online reviews, including how to get more salon reviews, and why it matters to your salon’s growth. Where Should I Get Online Reviews? Ok, there are hundreds of free directory profiles out there that your salon should be on, and most of them allow client reviews. However, I think because reviews are hard to come by, you should focus your efforts in just a couple places: Google and Yelp. Google is the largest search engine in the world, and when someone is looking for a new salon in your area, they search Google. What is the first thing you notice in the picture to the left? Besides the red arrow! The salon’s star rating? At the top of every local Google search is what is called the “local 3 pack.” Being listed in the 3 pack is CRAZY IMPORTANT! Most of the phone calls from new clients are going to these 3 salons because they are a the top of Google with positive reviews. 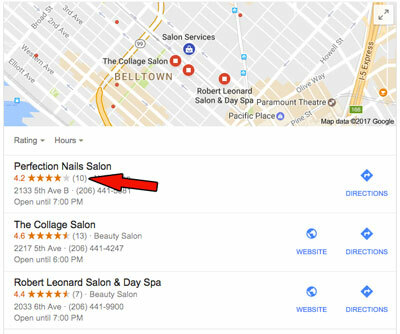 There are a lot of factors that Google looks at to place your salon in the 3 pack, but one of those ranking factors is the amount of reviews you have received. So…get more reviews, and you have a better chance of Google showing off your salon. Because more and more people are using it. While I believe more people are searching Google, there are a good amount of people that go straight to their Yelp app, and look for a salon. And when people searching Yelp, they are 100% of the time going straight to the reviews section to read what other people have said about your salon. This is the whole point of Yelp; its a reviewing app. As a salon owner, I would never pay for Yelp ads because I think they are overpriced for what you get. But having a strong free profile will get you new clients. Again, be present on as many directory profiles as possible, but if you focus all your review attention on these two, your phone will continue ringing. Of course your clients can go online and post reviews. Dedicate an entire page on your salon website to display your best reviews. Sometimes people go straight to your website, so make sure all your best reviews from Google, Yelp and other sources are there for them to see. Install a reviews app directly on your website. Your most frequent clients will visit your website from time to time, and if there is a reviews widget available, many will leave a review without even being asked. Now you have a unique review of your salon posted directly to your website for all to see! Create a reviews video like the one below. If this is beyond your technical abilities, I can create one for you here. The beauty of a reviews video, is you can embed it on your website, and it will also rank in Google when someone is searching for your salon reviews. We like to send out an email on someone’s second visit to our salon, and thank them for coming back. In the P.S. line, we ask them if they would be willing to post a positive review, and then we give links to our Google+ and Yelp page. We know if they have come back a second time, that means they like us! And if they like us, they are more willing to post a positive review. Also, if someone is processing color in your chair, and they are on their phone, maybe give them an incentive if they will post a positive review…right then and there. We also have little stickers on our mirrors asking people to “check in” on Facebook, or post a positive review. Sometimes that gets their attention, and they will do it. We live in a world that lives online. Often times a good online reputation is even more effective than “word of mouth” because people are so used to trusting what others say online when making a purchasing decision. Reviews are the foundation of your salon marketing. We strive for 1 positive review per employee each month. If they can meet that benchmark, your salon’s online reputation will totally stand out, and your phone will magically be ringing off the hook! This entry was posted in Salon Marketing and tagged online reviews, salon growth, salon marketing, salon reputation management, salon reviews. Bookmark the permalink.